My thanks to Paul Robinson for his photos used on this page. 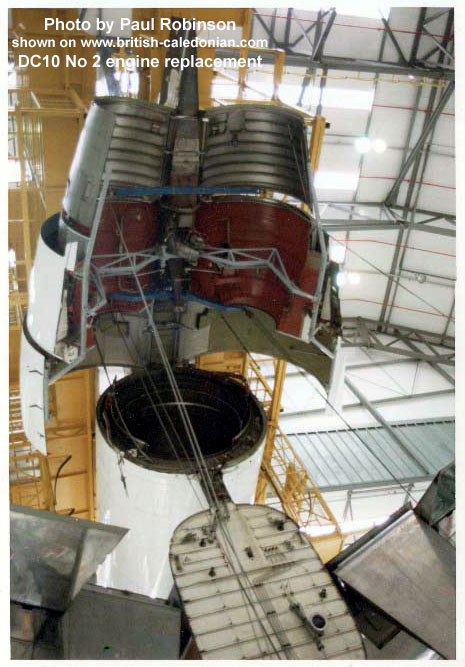 What weighs 8,531lbs (3,869kgs) and is mounted some 42ft off the ground? 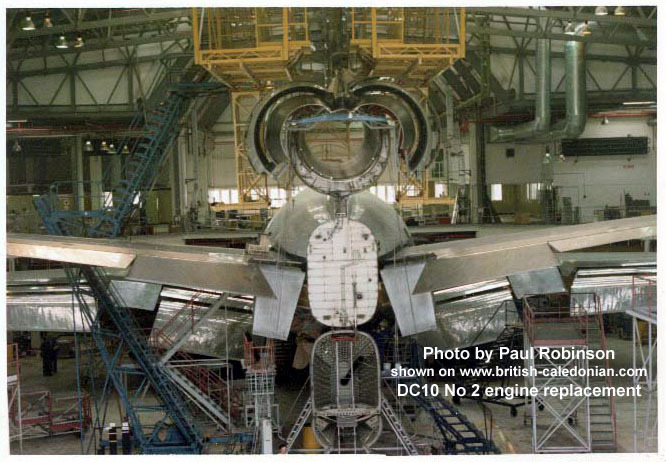 No prizes if you guessed the No.2 engine on a DC10. 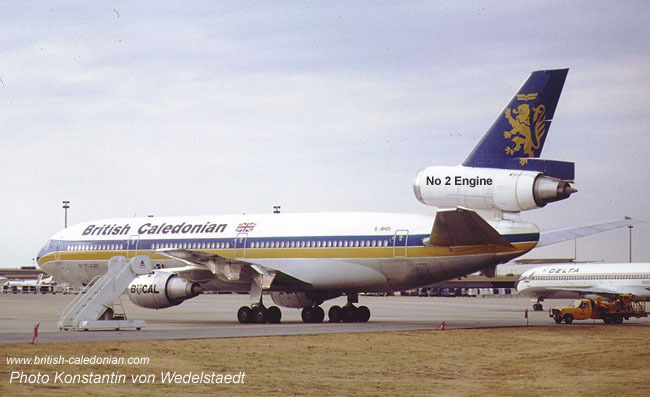 In common with all tri-jets; the main western types being the MD11, MD10, KC10, DC10, (not forgetting the L1011, B727 and the old HS Trident), the No 2 engine is tail mounted. 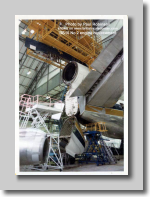 The tri-jets are becoming increasingly rare in passenger service, though the McDonnell Douglas wide-body tri-jets will be operating as cargo transports / refuellers for many years to come I am sure. 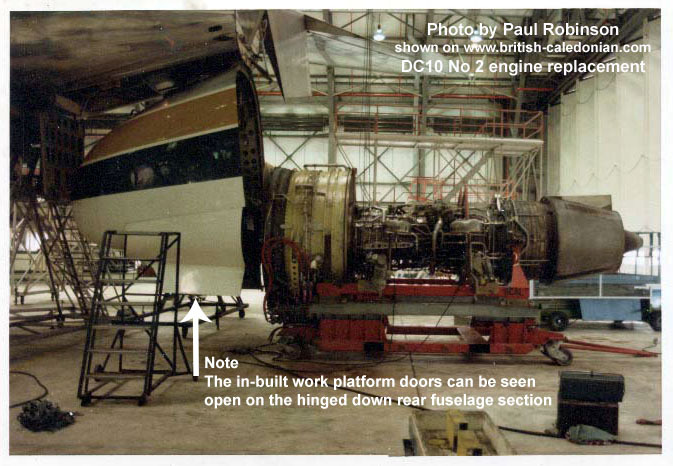 But mounting an engine high up on the tail does cause a number issues, probably the main one being access and also when it needs changing it presents unique problems, its heavy, its high up, and if you look at the aft end of a DC10, you can see that the rear of the fuselage protrudes under the engine too. 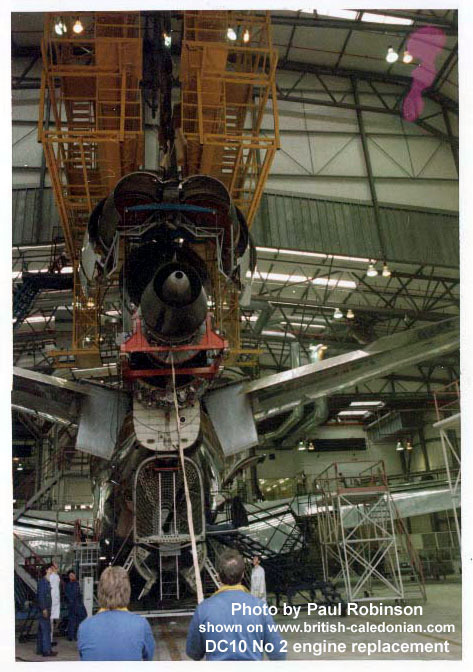 The good news is that most of what you see in the tail above is air intake, the actual engine itself is at the rear of the assembly. 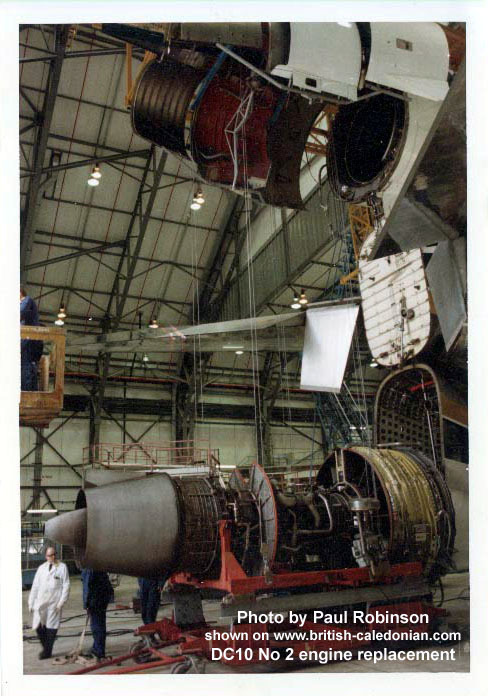 The DC-10's straight through intake reduced noise compared to a ducted airflow (like the S-Duct used on the L1011) and the straight intake also caused less distortion to the air as it flowed in to the engine itself. 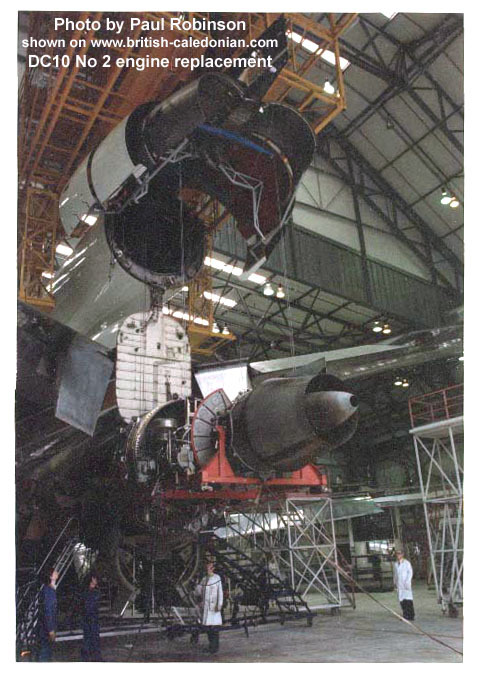 But if you needed to remove the engine, that was of course possible too. 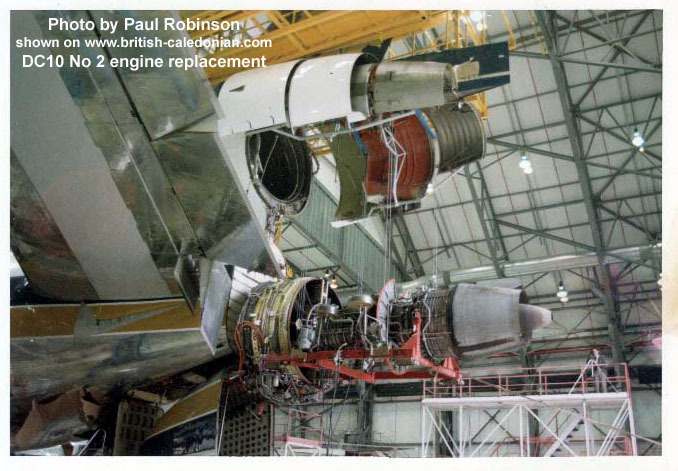 The great photo series below from Paul Robinson shows a No.2 engine replacement being undertaken at Gatwick, in Hangar 5. 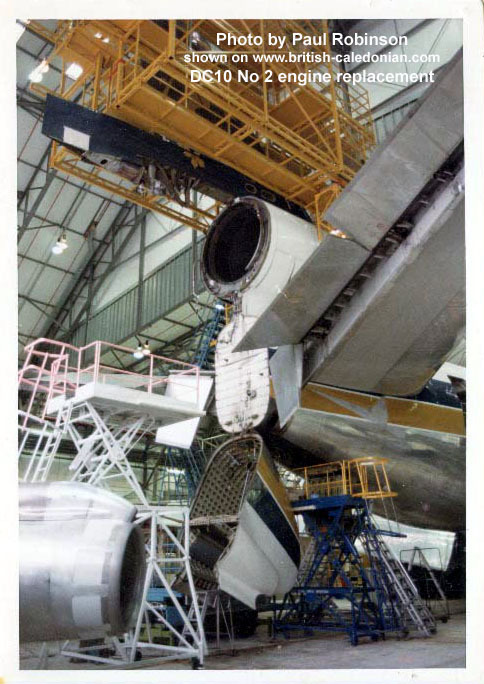 The rear fuselage section hinges down and the engine is lowered using a cradle, secured to the tail's structure. Though with all the access problems from having an engine so high, there are solutions of course. 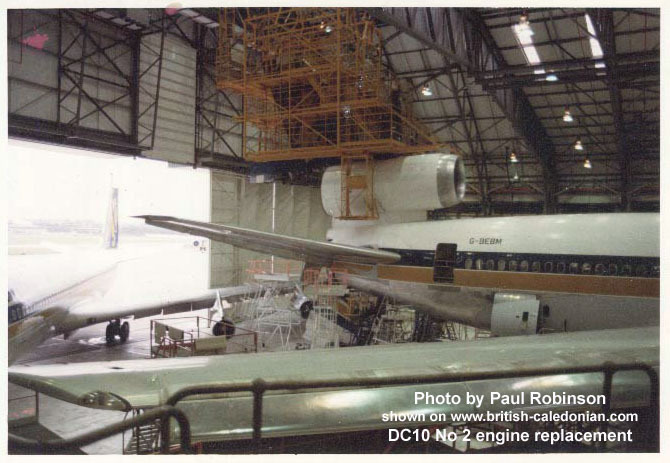 For inspections and repairs the DC10 had a work platform built in to the fuselage section just below the No.2 engine. 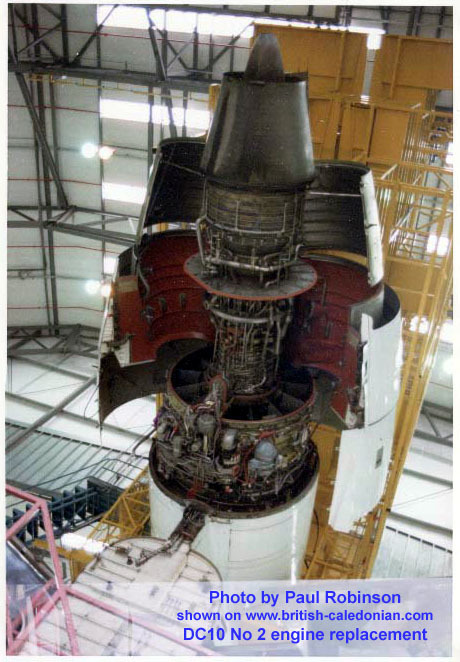 This made it possible to access the engine from a stable work area whilst away from base. 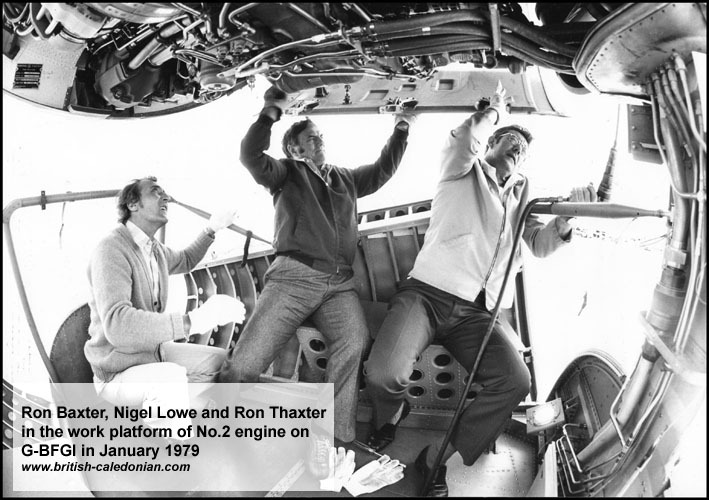 The photo below shows my father, Ron Thaxter, with Nigel Lowe and Ron Baxter, on the work platform of G-BFGI just prior to her delivery flight from the US in 1979.